I love using my Chimera Triolet with tungsten halogen bulbs, but what can I do if I want to daylight balanced light to match window light or HMI? The Triolet is one of the lighting professionals most useful tools. We understand that the need for daylight balanced light comes up, and there are definitely a range of options! – High Output Compact Fluorescent: A number of high output Compact Fluorescent (or CFL) bulbs have reached the market that provide the equivalent output of 400-600W halogen bulbs. Available in both Edison (E26) and Mogul (E39) sockets, these bulbs are 5000-6000 kelvin output. When shopping for these bulbs, be aware that a number of these bulbs come in 277 volt, while the US version of the Triolet is rated for 120V operation. – LED Bulbs: Because the Triolet can be converted to E39 or E26 (commonly known as Mogul or Edison screw base), the are compatible with a growing selection of LED bulbs. We have successfully used man CREE and Zuma brand LED bulbs that offer output in the 100-300W equivalent range. One key consideration is selecting a bulb that is A-Line shaped or frosted dome, meaning that the bulb produces omnidirectional light to best fill a lightbank. Common reflector-style or PAR-style LED bulbs do not produce the ideal quality of light for use with a lightbank. – Color Conversion Gel: The most common tool in lighting kits, Color Temperature Blue or CTB gel provides the simplest option of converting tungsten light to daylight. Chimera Lightbanks feature a deep front recess, that allows users to install our range of custom-cut color-correction front screens, or use clothespins / binder clips to clip on a cut of gel. 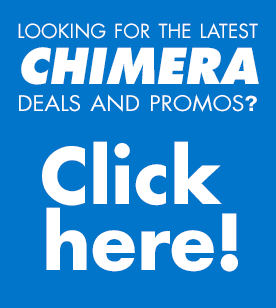 https://chimeralighting.com/wp-content/uploads/2017/08/chimera-lighting-logo-copy.png 0 0 Chimera Lighting https://chimeralighting.com/wp-content/uploads/2017/08/chimera-lighting-logo-copy.png Chimera Lighting2017-02-21 12:35:002017-07-03 13:36:17I love using my Chimera Triolet with tungsten halogen bulbs, but what can I do if I want to daylight balanced light to match window light or HMI? What modifiers can I use with the Triolet Profoto Adapter? Triolet vs. Socket Ring?